Have you heard of the Energy Bag program? The consumer buys specific orange bags upfront and can then fill them with soft plastics and poly-products that can’t be recycled currently. 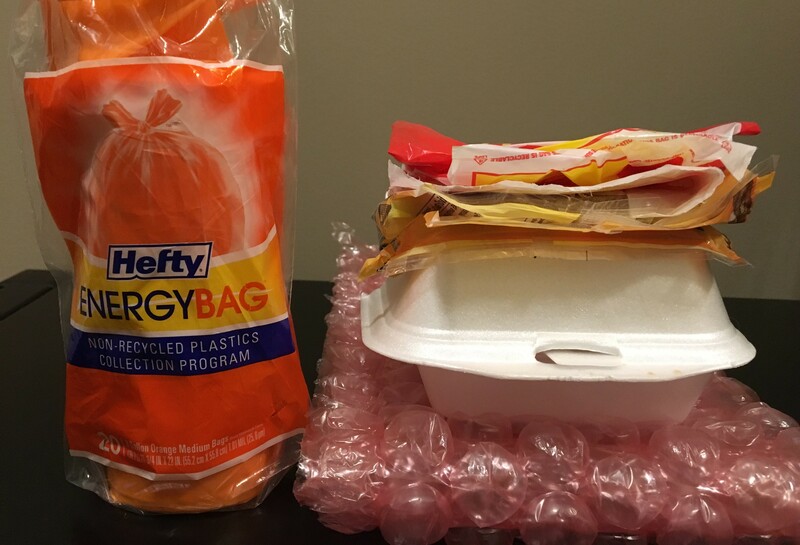 This include cereal box liners, straws, bubblewrap, chip bags, protective films, and Styrofoam, just to name a few. The bag is placed in your recycling container, making it easy to segregate from other recyclables at the sorting facility. We know that single use plastics are a big problem for our landfills and waterways. They are a huge contributor to toxic pollution when burned, producing both carbon monoxide and dioxin, two of the most toxic chemicals on earth. The program is called “energy bag” because the original intention was to burn them, and then use the heat as energy. The creation of energy (which would have been created by burning coal) is a positive, as is diverting the material from the landfill, and removing these items from the current recycling stream—which causes problems. On the flipside, using fuel to transport them to another state, then burned, which then releases toxins into the air that are then able to be breathed in, is not a positive. Changes have been made and orange bags are now being sent to a different state to a pyrolysis plant, where they are turned into diesel or oil. This is a slightly better process, but in the end it’s still being burnt for energy, it’s just now in an engine. Ideally, recycling materials into something else that doesn’t cause further harm is the preferred goal and the energy bag program currently doesn’t fit that criteria. The energy bag program has promise in the long run. The program has potential to effectively transition from an energy recovery process to a recycling endeavor, but in order for that to happen, investors need to know a volume exists. For more information, read this. As we work on our Net Zero Waste goal, many have asked why we’re not participating in this program, we certainly have a lot of plastic! Answer: burning plastic/releasing toxins does not meet our mission, and our waste goal states no incineration. However, our volume could help this program and we are looking into safe, appropriate ways to collect and ship it.